This week the gadget is all about shrimp… plus a classic spice takes on a new rub. GrateTV is a weekly webcast on all things BBQ and grilling from backyard to the competition circuit. Jack and I had a good time knocking out a few shrimp on the “barbi” but he was quick to discover that our demo on deveining would not be as slick because I had purchased cleaned and de-veined shrimp. Oh well. That’s why GrateTV is on YouTube not Food Network. Shrimp is a good thing for the show… it’s super quick to cook and our show is only a beer in length so we can pretty much get it all done quickly. As for recipes in the show… all we did this week is rub down the deveined shrimp with our secret ingredient for the week… Old Bay seasoning. In fact, Old Bay has a spice RUB that is prepackaged for things just like this. It’s a lot like the seafood/shrimp/crab seasoning that is the Old Bay namesake bit they’ve added som sugar and it works really nicely on shrimp. Jack chose to peel his and then rub with spice. I like to split,devein and leave the shell on with the rub. I think the shell helps me from overcooking and I like the nooks and crannys that contain all the spice rub and smoke. We have a bunch of fun things planned for GrateTV in the coming weeks and months. Do you have any ideas for extreme bbq? The bigger the better. Five alarm spicy hot (extreme heat). Fun with fire and hot coals. we’re looking for crazy bbq ideas and are open for suggestions at jack@gratetv.com and Bill@gratetv.com. We’re putting together a summer of Extreme BBQ… so keep checking back here or subscribe to the mayny feeds we’ve set up from YouTube to iTunes or our email feed. If you already know about shrimp you can just take a look for the fun of it… but don’t forget to rate the show on youtube and sund us a GratePlate photo here. 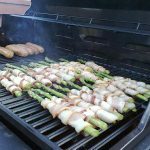 One of the techniques one needs to master before becoming a barbecue professional is how to grill bacon wrapped foods. Bacon is used to wrap seafood (shrimp and scallops), vegetables (cheese stuffed peppers) and meats such as filets of beef and pork. Wrapping boneless and skinless stuffed chicken thighs in bacon is also gaining popularity. 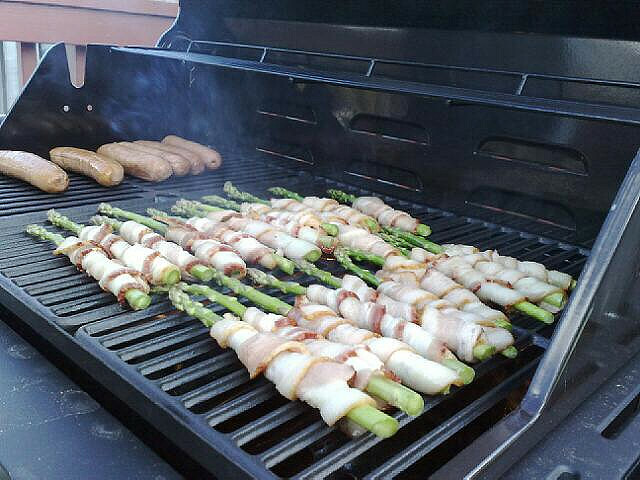 However grilling bacon wrapped foods is not a straightforward endeavor. The two biggest challenges you face when grilling bacon wrapped foods is preventing grease fires and getting the bacon finished at the same time as the food it is wrapped around. Grease fires are extremely common when cooking bacon wrapped foods. If dripping bacon fat comes into contact with lit charcoal or propane flames them a flare up fire is inevitable. The easiest way to deal with situation is to always cook bacon wrapped food with indirect heat. If the bacon is not directly over a heat source then the probability of a grease fire is greatly minimized. When grilling with indirect heat it is a good idea to use a disposable aluminum drip pan underneath the food. The foil pan will catch any grease and make subsequent clean up much easier. Once you have taken steps to minimize grease fires you can start working on getting your bacon to cook at the same rate as the food it is wrapped around. This is most easily accomplished by using thinly sliced bacon instead of the more expensive thick cut varieties. This is not as important if you are grilling food that takes 20-30 minutes to finish such as pork tenderloin but is critical if you are working with quick cooking foods like shrimp and scallops. A second trick to employ with quick cooking food is to partially precook your bacon before wrapping. You can put a few slices of bacon in paper towels and microwave on high for one minute to get you bacon about halfway done cooking. The only drawback to this approach is that it is easy to overcook the bacon which makes it extremely difficult to wrap around your food. A better approach is to blanch the bacon in boiling water for one minute. The blanching approach takes a little more work but helps make sure the bacon remains pliable enough to use as a wrapper. The final tip for grilling bacon wrapped food is to pay particular attention to your seasonings. Most bacon has a very high salt content. This means that the amount of extra salt you use to season your food should be kept to a minimum. With a little practice you can avoid grease fires and get your bacon cooked at the same time as the food it is wrapped around. Master these skills and you are one step closer to becoming a grill master. I am an avid griller who loves to write! I run web sites about Weber grills and pork tenderloins because that’s just the sort of thing I enjoy. I invite you to visit my other sites and take a look!